Dubai, UAE, June 26, 2018: Spring into a new era of Goth where dark meets light and moody meets bright. This is not your mother’s Goth. Meet Goth-O-Graphic, a world where unicorns have perished, but their holographic shadows remain, resulting in an unexpectedly bold colour statement. Pastels are offset with a bright pop, and skulls glow with holographic dimension. The launch of this limited-edition collection coincides with the brand’s #BreakingBeauty campaign. Since its start more than 35 years ago, wet n wild® has been a trusted beauty destination for all walks of life to feel bold and empowered. 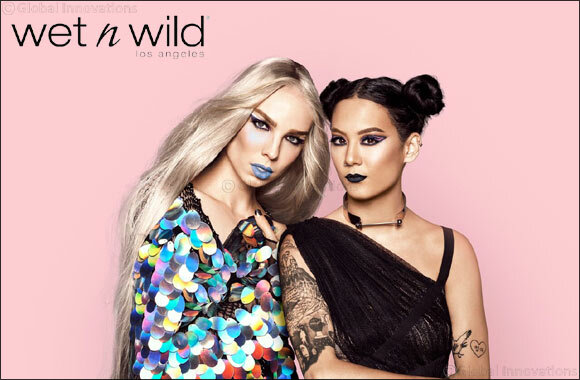 Wet n Wild®’s #BreakingBeauty mission is to defy outdated, traditional beauty standards and celebrate all beauty. No matter your shape, size, height, race, ethnicity, etc. Wet n Wild believes every woman should feel confident being uniquely you! This soft, finely-pointed felt tip liner gives you ultimate control over your graphic look. It is available in three cruelty-free, gluten-free, fragrance-free and paraben-free shades. Give your eyes a holographic edge with this high-impact liquid glitter shadow that features pearl pigments which combine for a multi-colour shimmer effect. Available in four cruelty-free, gluten-free, fragrance-free and paraben-free shades. Highlight those bones with this buildable shimmering powder that’s perfect for the face and body. It contains Nylon to help promote bendability and impart an elegant silky texture. Best for a high-impact glow and available in one cruelty-free, gluten-free, fragrance free and vegan shade. Achieve a high attitude glow with this fan-favourite highlighter made with high-impact shimmering pearl powders. Featuring micro-fine pearl pigments which combine for a targeted multicolour highlight and Nylon which helps promote bendability and impart a silky elegant silky texture, it is available in two shades. Rebel lips will crave this weightless formula that glide on like a dream. It provides vivid colour with an ultra-matte metallic finish. Film forming agents ensure longwearing benefits and emollients help provide comfort to the lips. The formula contains macadamia derivative to help provide moisture and Vitamin E to help improve the appearance of texture. Available in four cruelty-free, gluten-free and fragrance-free shades.